Posted On June 08, 2015 by Team iCynosure. You know how much I love to shop from the comfort of my home, but sometimes that gets tedious too. Switching from one tab to another, surfing through numerous websites to find that gorgeous dress or that perfect handbag erodes into my precious time and I hate that. Wouldn’t it be perfect to have a specific search engine for fashion? Then all I would need to do is open the website, search through the collection across various brands and sites and shop. Well you must think that impossible. But you will be surprised just as I am to know about StyleBuys.com; a leading search engine for fashion that provides fast, convenient and enjoyable shopping experience. The platform is a summative collection of fashion websites in India offering users the convenience of shopping from one point after browsing through a huge number of products. 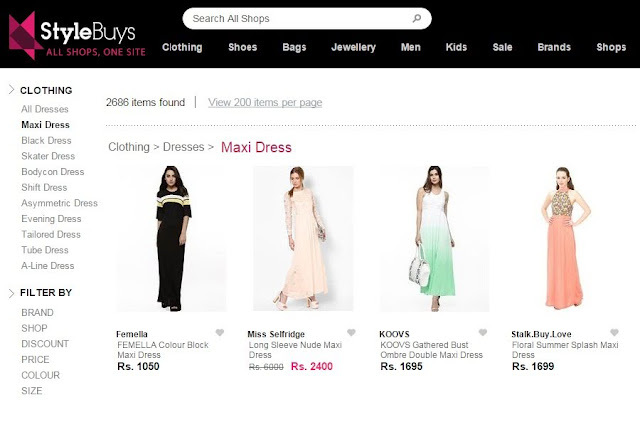 Recently launched in India, StyleBuys is a subsidiary of Stilgiyin.com, the fashion search engine of Turkey. The platform offers products from brands like Amazon and Flipkart to Jabong and Myntra to specialised sites like StalkBuyLove, FabAlley and Koovs, lingerie giants Zivame and PrettySecrets and luxury brand Darveys. So the tagline that they go by ‘All Shops, One Site’ is perfect for the platform. A shopper has the convenience to search via brands or categories or even specific phrases. It allows to view almost 200 products per page so it gives some amazing options at one go. The concept of the platform is to give shoppers a comprehensive list of options available in each category across various shopping sites. The platform independently is not a shopping site. When a product is chosen it takes the shopper to the brand website to continue shopping and hence all the shopping, exchange and returns are governed by the terms of the said website and not StyleBuys as they have no control over it. What do you think about this fashion search engine? yeah its such an amazing & unbelievable..